Reconnaissance of Romerly Marshes Georgia. 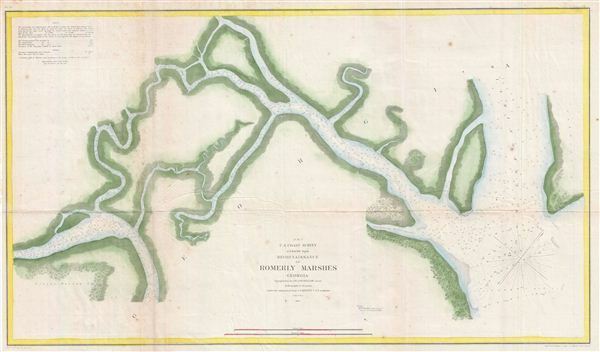 An uncommon 1855 nautical chart or maritime map of the Romerly Marshes, Georgia. Romerly Marsh is a popular hunting and fishing area just south of Savannah, Georgia. In the 1850s Romerly Marsh was particularly difficult to navigate due to its 'excessive crookedness' and 'sharp bends.' Drawn on a scale of 1:10,000. The triangulation for this chart was completed by A. W. Longfellow, a nephew of the famous poet. The Hydrography was accomplished by a party under the command of J. N. Maffitt. The whole was compiled under the exacting direction of A. D. Bache, Superintendent of the Coast Survey. Very good. Minor toning. Original fold lines. Blank on verso.